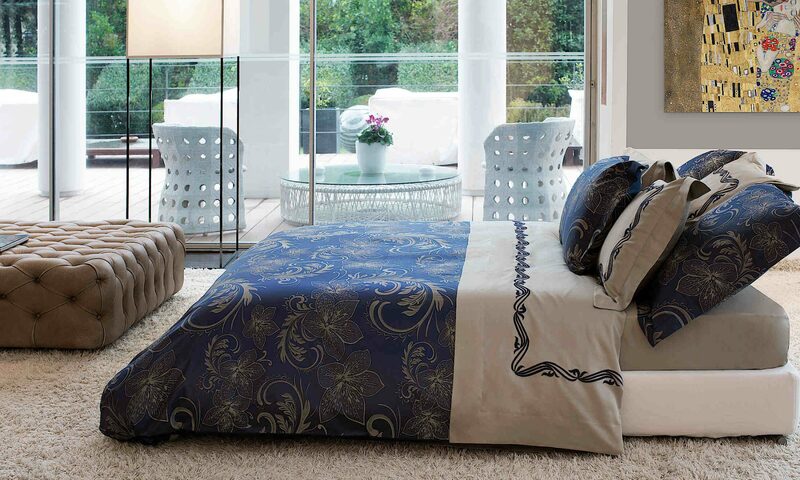 The Comedy bedding collection from Alexandre Turpault is a 300 thread count 100% Egyptian cotton sateen print. Creating an inviting bed begins with comfortable and soft sheeting. This bouquet of delicate cherry blossoms is offered in a palette of soothing grape or pale blue inducing a calm setting to a sophisticated bedroom. The duvet cover and shams reverse to a coordinating pattern on the back so you can change the mood with the different styles. The quilt is done in the coordinating pattern fabric and embroidered with cherry blossoms. 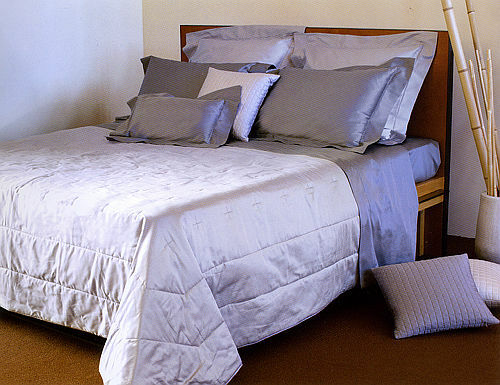 This collection can be combined with a solid fitted sheet and pillowcases to complete the ensemble. Made in France. Beautiful faux furs from No Harm Done Design are available in throws and decorative pillows. 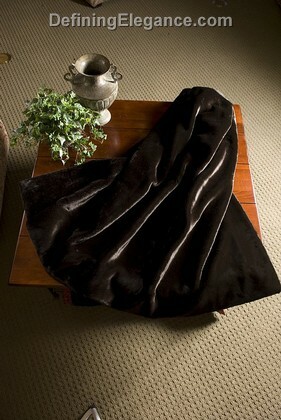 The Sheared Mink throw as shown in the photo is incredibly soft and rich in color. Faux furs have several advantages that make them desirable as decorative accents. Unlike natural furs, faux fur does not require cold storage, they’re less expensive, and they’re more resistant to deterioration. First introduced in 1929, faux fur has gained popularity in recent years both in fashion and home textiles. Improved technology has produced the quality pile, texture, and coloring, which makes these popular alternatives to natural furs difficult to identify from the real thing. No Harm Done Design throws and pillows are irresistible and the perfect touch of glamour for your home. Dress your windows with Haro drapery panels from Softline Home Fashions. 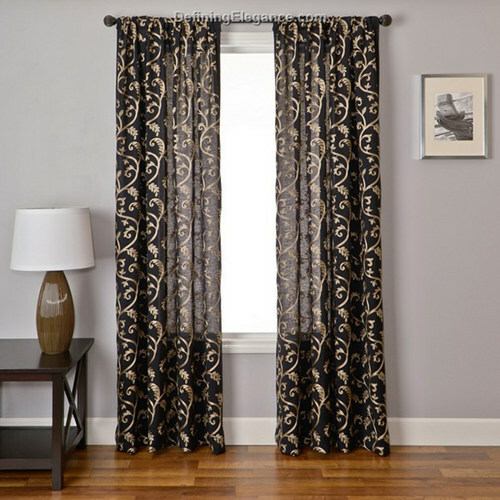 These window treatments are available in three styles: Rod Pocket, Back Tab, or Grommets. The back tab style offers the versatility of using the rod pocket for a gathered look or using the back tabs on the back of the panel to form soft pleats. We offer the option of lining or lining with interlining. The addition of interlining gives the drapery more body, protection from the sun, and better insulation. It also gives it more of a custom look. Available in 4 lengths – 84″, 96″, 108″ or 120″ and nine colors. An optional scarf valance with or without lining draped over the top of drapery adds another layer for more interest. See all the Softline drapery fashions offered on DefiningElegance.com to find the perfect style and color for your home. The Monna Lisa by Signoria Firenze is a 100% Egyptian combed cotton sateen 300 thread count quilted cover. Made in Italy with a simple cross stitch design, this luxury quilt is available in 8 colors, including seven of Signoria’s beautiful neutral colors and also in their luscious Wilton blue. The subdued colors allow you to embrace a serene and peaceful setting or to allow bolder colors in other elements to take center stage. The Monna Lisa quilt is the perfect companion for any Signoria bedding collection that will make family or guests feel pampered and drift off to blissful sleep in complete comfort and warmth.